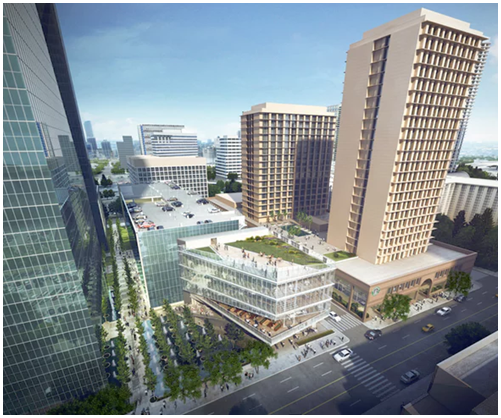 ​​​​​DALLAS – One of downtown Dallas' most familiar towers is in the midst of a major makeover that will bring additional parking and a new look to the skyline. Owners of the 60-story rocket-shaped Fountain Place are spending more than $70 million on the office building. Goddard Investment Group is building a new garage and retail building on the northeast side of the green glass tower. Wells Fargo Bank has committed to keeping 123,650 sf in Fountain Place for its flagship Dallas location. In all, more than 500,000 sf of extended office deals have been signed in the 1.2 million-sf building, according to property agents at Cushman & Wakefield of Texas who lease the tower. a training room to accommodate up to 150 people. The upgrades will also include renovation of the tower's signature fountains and landscaping around the base. Most of the work will be done early 2018. ​Want more​ data? See DFW Office and Retail Market Research.